How nice, something to stir up the appetite while waiting for the forthcoming Grizzly Bear album. Which is quite an unfair thing to say actually, and to be perceiving Grizzly Bear’s guitarist, Daniel Rossen’s, side project, as nothing but. 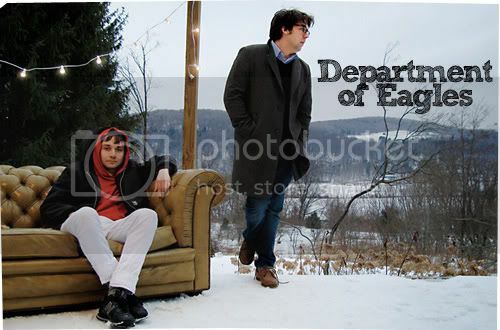 But so help me, if I keep comparing Department of Eagles to the brilliant New York folk quartet; the resemblance is fully in the flesh and the dreamy, widescreen sonic surfaces are evocative of the best moments in Yellow House. 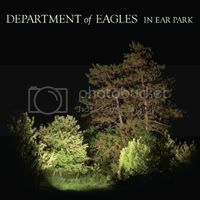 But needless to say that In Ear Park is a tremendously mesmerizing record in its own right, worthy of multiple spins when the need for gorgeous, reflective listening arises. Rossen’s dreamy, warble of a voice makes a perfect pairing with the lush soundscape, something that most musicians don’t often normally get right these days. But further into the record, songs seems to dangerously border monotonous terrains, slowly losing the drama it gained earlier at the start. But there’s still so many to like and admire about the album, that even the littlest things doesn’t ruin the impressive workmanship that it grandly exhibits. A perfect example is the album highlight, ‘No One Does It Like You’: a bouncy, wistful homage to '60s pop that's so yearning, it seems to be nostalgic for nostalgia.